Tuesday dawned bright and rather bleary-eyed. After a thankfully restful night’s sleep, I woke up this morning to the realization that last night’s itchy left eye was probably developing into something more acute. I’m on the mend after an early-morning MDLive consult (a perk of my MediShare plan) from my hotel room and a prescription pick-up at the Venetian Walgreen’s. I had to laugh when the tele-doc suggested I visit the MDLive booth after I told him I was here at HIMSS. 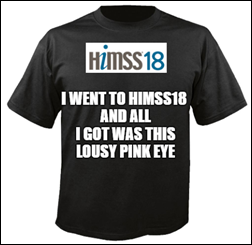 I’ll likely keep a low profile at the conference today, popping in briefly to say hi to Lorre at our booth, 11288, in Hall G. I’ll be using copious amounts of hand sanitizer, so will pick up one of Arcadia’s handy HIMSS18 Survival Kits they’ve so kindly supplied us with as giveaways. But let me back up … Arriving a full day ahead of exhibit hall hours has been a thoroughly enjoyable experience aside from my health issues. 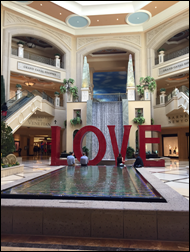 I spent most of Monday morning wandering around the Venetian and Sands to reacquaint myself with the lay of the land. Much like my time in Venice years ago, it took me longer than I expected to orient myself. 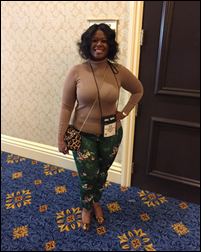 That time, though, was not lost, as it gave me a chance to chat with attendees like Orchid Webb, director of clinical transformation at GMP Network (MI), a physician-based organization that helps independent MDs with technology, payer relationships, and the overall move to value-based care. Webb had good things to say about EagleDream Health, a cloud-based analytics company acquired by NextGen last fall that has assisted GMP physicians with upping their population health efforts. 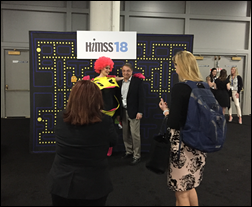 Though she wasn’t at HIMSS to shop for anything in particular, Webb told me she does have telemedicine on her radar, validating my comment in yesterday’s write-up that attendees are looking more for immediate-impact patient care tools than the razzle dazzle of evolving concepts like blockchain. 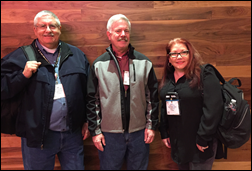 I also had the chance to talk with a trio from St. Jude Children’s Research Hospital (TN), who had gathered outside of Starbucks to get their pre-conference symposia game plan together. Senior Clinical Analyst Jon Jernigan (left) and friends will be hitting the exhibit hall today to look at products related to interoperability and analytics. Vendors on their stop-by list include PatientSafe Solutions and Health Catalyst. The foot traffic seemed slower, of course, than it will be today. 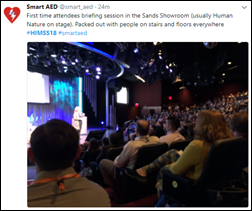 I’ve read somewhere that HIMSS expects 50,000 folks to descend on the Sands, with that figure later being adjusted to 43,000. It might not be too far off the mark if standing-room only events like the first-timers orientation are any indication. Several conference-goers found time to escape the escalating attendee rush near this fountain, which is surrounded by very tranquil Chinese décor. I love the fact that every coin tossed in is donated to The Dr. Miriam and Sheldon G. Adelson Clinic for drug abuse treatment and research here in Vegas. 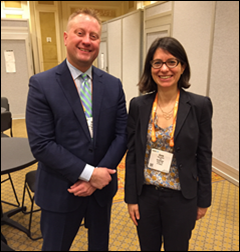 I was happy to get off my feet for a bit in the media room where I caught up with Wellpepper CEO Anne Weiler and Mayo Clinic Global Business Solutions Senior Director Shayn Carlson. They brought me up to speed on Wellpepper’s new care plan partnership with the clinic. The organizations will launch Mayo Clinic care plans for cardiac rehab, headaches, and sports medicine on the Wellpepper Marketplace in the coming months, with additional plans in the works for later in the year. Wellpepper has developed a patient engagement platform that enables hospitals to deploy their own treatment plans within an app that guides care delivery outside of a provider’s four walls, and then collects outcomes data providers can use for analysis. The two organizations have known each other since 2015, when Wellpepper won Mayo Clinic’s first Think Big Challenge. 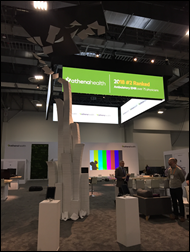 After some afternoon R&R at the hotel, I headed back to the conference for round two, which included a guided tour of Athenahealth’s new art installation, the keynote, opening reception, and an intimate dinner hosted by the AMA and IBM Watson. The 5,000-pound stack of paper above will surely drive traffic to their booth (plus they’re right next to the restrooms in Hall A, which is always a good spot to be near). Coupled with a pretty cool augmented reality experience, the artwork tells the story of paperwork’s burden on physicians in terms of cost and burnout. The company’s talking points this go-round will be expanded, machine-learning based services for document management and coding that will help physicians reduce paperwork and data entry. They’ll also be demoing a new, more EHR-friendly Epocrates app – a move that Chief Product Officer Kyle Armbrester is pleased about given the company’s heretofore lack of focus on that brand. As expected, the keynote overflow room was filled to capacity and so I joined my colleagues in the press room to watch what passes for an Olympics-like opening ceremony at HIMSS. As Mr. H alluded to in his write-up, the vocalists from The Voice that preceded Eric Schmidt of Alphabet were certainly talented, but an odd choice. I couldn’t help but wonder how much money HIMSS could have saved, or diverted to other more patient-facing causes, had they passed on the opening act. I saw most of the keynote, but only heard the last 10 minutes thanks to audio issues in the press room. Eric Schmidt essentially told the audience to hurry up and catch up so that Google and other consumer-facing companies can put their technologies to good healthcare use. The post-keynote opening ceremony was unusual in that it was held downstairs in Hall G (a ploy to get people down there today, perhaps?). I can’t remember a HIMSS where the opening reception was held in the exhibit hall. The theme was fun – 80’s nostalgia with a focus on arcade games and music, courtesy of a high-energy DJ. I didn’t stay long. But the vibe became too weird. I knew it was time to go when Baby Got Back started playing. All attempts at legitimate health IT-focused convo had to be abandoned. I happily headed over to a far more intimate gathering hosted by the AMA and IBM Watson. It was nice have a sit-down meal with 40 of my closest peers to hear from AMA CEO James Madara, MD, IBM Watson Health Chief Health Officer Kyu Rhee, MD and Mayo Clinic CIO Criss Ross, who had many stories to tell of the positive impact Watson technology is having on Mayo Clinic point-of-care processes. (Ross is one of 60 Mayo staffers here at HIMSS, and considers himself to be a rookie among his Mayo colleagues, given that he’s been at the organization for only five years.) He made it clear amidst all the talk of AI and machine-learning, that, at only three years old, Watson is still learning and Mayo is still realizing its capabilities. It was refreshing to hear him say he’s more interested in “little AI” than “big AI,” meaning that’s he more likely to use it for simple utilities than big moonshots. Fun fact I didn’t know: Eric Schmidt is on Mayo’s Board of Trustees. After a delicious piece of tiramisu, I called it a night. Great summary of the opening night! Wast it just me or the Pacman display for opening reception feel out of place too?